Featured in today’s post is Café Vendôme in the Buckhead/Sandy Springs neighborhood of Atlanta. I had the chance to visit this lovely spot last month. 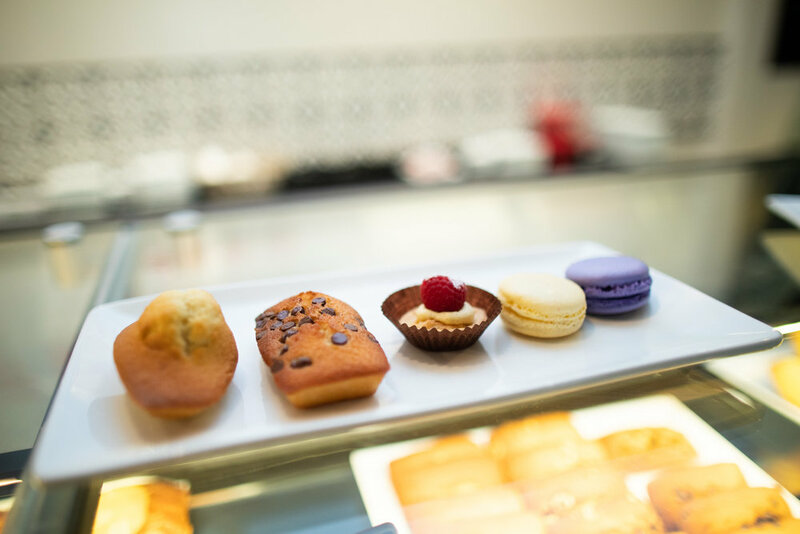 Café Vendôme is more than just a coffee shop, but a full-fledged bakery in which pastries, baguettes, desserts, and other goods are baked in-house on a day-to-day basis. During my visit, I spent some time talking with Hamid, the owner of Café Vendôme. One of the things Hamid mentioned is that before founding Café Vendôme, Hamid scoured Atlanta and was not able to find truly authentic French bakeries; his vision came to reality a couple of years ago with the founding of Café Vendôme. Hamid actually spent majority of his career in a technical field (telecommunications) but always had an eye (and taste) for quality food. I asked him if his previous experience working in a technical field was a deterrent for opening up a bakery, and he mentioned that, in fact, it was in many ways advantageous because he built up valuable business experience that translated to owning and running a small business like Café Vendôme. From the fresh food to the interior decor to the ovens (imported from France) to the counters on which desserts are placed—everything is French (or European) inspired. According to Hamid, the crowds have flocked to Café Vendôme since day one. In fact, the café has been such a popular success over the last two years that a new location of Café Vendôme is opening up at the City Walk in Sandy Springs in late December 2018! Photos from my recent visit are below. Exterior view of Café Vendôme. The building entrance is located at the back side of the Belle Isle Square on Roswell Road. Front entrance to Café Vendôme. The building entrance is located at the back side of the Belle Isle Square on Roswell Road. Interior of Café Vendôme. Hamid, the owner, is seen in the background. Interior of Café Vendôme. The macarons decorate a miniature Eiffel Tower near the entrance. One of my favorite parts about Café Vendôme is the interior decor, but especially the wallpaper adorning the wall below. It is life-size and feels like the room is extending into Rue de Francs Bourgeois at Place de Vosges. That bicycle looks as though it is inside Café Vendôme—alas, it is part of the wallpaper! Interior of Café Vendôme. The painting in the background is incredible. Hand-written notes seen inside the café. Croissants and other freshly-baked pastries on display at Café Vendôme. Tartelettes—a chef’s assortment of delicious tartes. An area at the back of Café Vendôme where visitors can observe the baking process in action. Culinary art live! Plenty of seating at Café Vendôme including high chairs and comfortable couches. Fresh baguette ready for consumption! And in case you were wondering about the coffee: the beans are sourced from Counter Culture Coffee and all of the baristas at Café Vendôme have been personally trained by their team. A mocha that I ordered at Café Vendôme. If you’re looking for an authentic French bakery and coffee shop in the Atlanta area, look no further than Café Vendôme. From my conversations with the owner, Hamid, and tasting of the food and coffee here, every effort is made to deliver an amazing experience. I’m really looking forward to checking out the new Café Vendôme opening up in Sandy Springs City Walk soon!